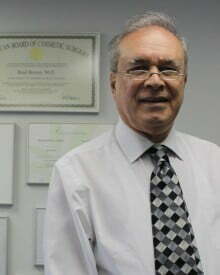 Dr. Riad Roomi, a dual British / American National trained in Plastic Surgery in the UK in the early 80’s. He established his own practice in London (UK) in 1989. However, he worked in KSA for 5 years (2000-2005), Oman (2006), and Dubai (since 2007). You New Plastic Surgery Clinic was established in 2010. Among the procedures he routinely carries out are facial aesthetic surgery (face lifting, blepharoplasty “eyelids tucking”, fat transplantation, lips augmentation, liposuction of under chin- area, and otoplasty “ear pining”, body re- contouring (liposuction, abdominoplasty “tummytuck”, and breast surgery (breast augmentation, lifting and reduction). Hair Restoration surgery is also part of Dr Roomi’s practice. He carries out hair transplantation (head, beard, eyebrows and eyelashes) and scalp reductions. Some reconstructive surgery is also carried out at the clinic such as scar revisions and tissue expansions. I have admitting privileges at Belhoul European Hospital, and The City Hospital (DHCC) in Dubai, UAE where I currently carry out my major procedures. Registered and Licensed by the UK’s General Medical Council. SMART Award 1988: Awarded a sum of £35,000 by the DTI ( British Department of Trade and Industry) to prepare a feasibility study for “Ready-Stitch”. Prize Winner, Scottish Invention of the Year Competition, 1988. 1st Prize, Toshiba Year of Invention Competition, 1989: Administered by the Design Counci in UK for my invention “Ready Stitch Wound Closure Device”. Overall number of entered inventions: circa 4000. Richardson Gold Medal, 1989: Awarded by the British Institute of Patentees and Inventors and presented at the House of Lords. Biographee in Best of British Men, 1993. A book by Martin Miller. Biographee in Who is Who in the World, 1996. Alwash, RH; Fadhli, AA; Roomi, R: Nocturnal Enuresis. The Journal of College of Medicine, Baghdad, Iraq. Vol. 24, No. 2, 1982. Roomi, R Warren R A: A study of skin adherence and irritation of self-adhesive surgical tape in 100 volunteers. Presented at the Biological Engineering Society, 1st International Conference; Textiles in Medicine and Surgery, 11 and 12 July 1989. Warren, RA; Roomi, R: A Study of Skin Wound Closures comparing Ready-Stitch with Conventional nylon sutures. Annals of Plastic Surgery, volume 25, No. 3, September 1990. Co-authored “A Word About Cellulite”, a chapter in a book published in the U.S., entitled “A New Body In One Day, A Guide to Local Anesthetic Cosmetic Procedures”, by Robert A. Yoho, M.D. and Judy Brandy – Yoho, R.N. Hair Bank, A New Method for Delayed Hair Transplantation Through Freeze – Storing Hair Grafts, Preliminary Results of a Pilot Study. Presented at the 6th Annual Meeting of the International Society of Hair Restoration Surgery in Washington, D.C., 16–20 September 1998. Roomi, R: The Use of Autologous Fat Transplantion to Remedy the Iatrogenic Lipo- atrophic Effect of Tissue Expanders. American Journal of Cosmetic Surgery. Vol 22, No 3, 2005. Roomi, R: “BAMBI”: Bilateral Augmentation Mommomplasty By Injection. Breast Augmentation using Autologous Fat Transplantation. The Controversy and Personal Experience. Presented at the American Academy of Cosmetic Surgery World Congress on Liposuction Surgery and Advances in Cosmetic Surgery. Dubai, UAE. October 29-31, 2007. Roomi, R: “BAMBI”: Bilateral Augmentation Mommomplasty By Injection. Breast Augmentation using Autologous Fat Transplantation. The Controversy and Personal Experience. American Journal of Cosmetic Surgery. Vol 26, No 3, 2009. 1. Improvements in or relating to surgical dressings for closing wounds. U.K. Patent No. 2083753. 2. Surgical Dressings. U.S Patent No. 4423731. 3. Adhesive Suture. U.K. Patent No. 2233231. 4. Infant Identity Mark. U.K. Patent No. 2273266 B. 5. Infusion Device. U.K. Patent No. 2285620 B. 6. Vehicle Parking Control System. U.K. Patent No. 2285881 B.
Dermatosuction Apparatus for Treatment of Lipodystrophic Panniculopathy (commonly known as Cellulite).